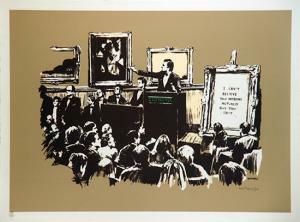 A screenprint by Banksy that pokes fun at the art world has sold at auction in London. The print, which takes a dig at auction houses like Sotheby's, first appeared on the artist's website after Bombing Middle England reached £102,000 at auction in February. Haha. This one always makes me laugh.